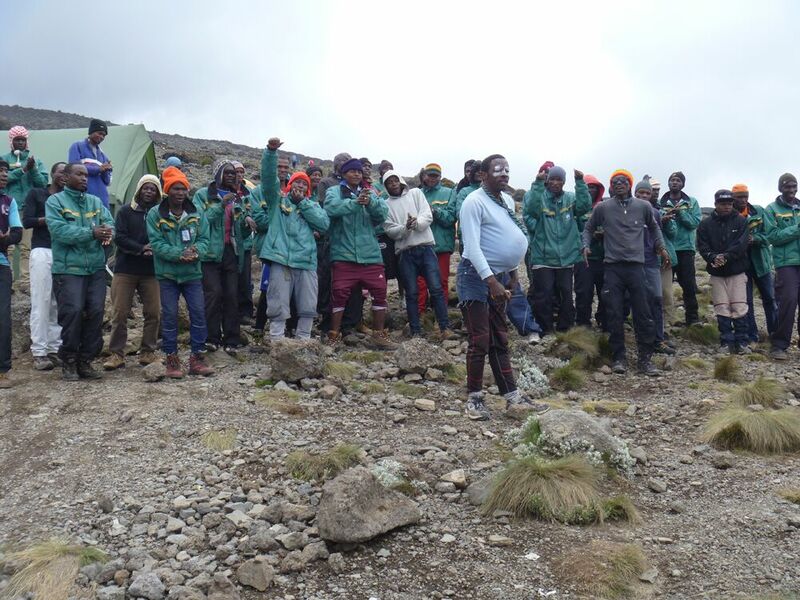 In February 2016 I was one of a group of 14 people trekking the Lemosho route in an attempt to reach the summit of Kilimanjaro. I considered writing my story of the route, how many people suffered altitude sickness and what I did every day. However, many other bloggers have already done that and therefore this is my personal account of my experience with the team at 360 Expeditions. My journey with 360 began when I first made contact via e mail. I think I knew at that stage that I was in good hands as they showed experience, capability and a desire of wanting me to succeed right from the beginning. What did I really know about the adventure I was about to embark on? Well I had looked at some videos on You Tube, I had talked to friends who had been before and of course I had been talking to the logistics folks of 360. Did it prepare me? Yes and no. I had training treks along the way and I was playing tennis on a regular basis and I knew that I was becoming fitter and building stamina. But how fit would I need to be and how would I cope were still questions flicking through my mind on a regular basis as the date of departure became ever closer. Did I have the right kit and most importantly for me, would I be warm enough? The kit list provided by 360 is a great start and one that I adhered to. The only challenge was working out which items to buy, as there are major price differences between them. For example, when it comes to a waterproof you can spend anything from quite small to really expensive and then there are different levels of waterproof protection. In the end with choices made I packed my gear, said my good byes and before I knew it found myself in Nairobi. My anticipation continued to build as I knew that on the next short hop flight I would be able to see Mount Kilimanjaro. And suddenly there she was a mountain that seemed to taunt us, a mountain clearly visible on a beautiful sunny morning. At that point my stomach back flipped and for the hundredth time I wondered what had inspired me to take this trip. One of the defining moments of the trip for me was when our group met Rolfe (our 360 leader) and some of the guides for the first time. If we didn’t get on it was going to be a challenging 10 days. Did I need to worry? No. Rolfe is very matter of fact and gets on with the task in hand and with his sense of humour I knew we were heading for an amazing experience. Before I left the UK I decided that I would imagine I was on a TV game show and take that approach to help me get safely up and safely back. I imagined that on a TV game show I would be told what to do, where to go, when to take part etc., and it was that approach I used from the moment of being met at the airport. I took the view that 360 would help me get to the summit if I listened to their words of wisdom and guidance. After all they had huge experience of this route and this mountain. It was an approach that served me well. Tempting though it can be to want to walk faster in the early stages of the climb, I kept reminding myself that I was not the expert and that 360 would get me there if I carried on following their advice. I followed their advice and found myself enjoying the experience more, after all this summit attempt was not just about the summit. As Rolfe mentioned at the beginning, the people that take the most away from the adventure are the people that enjoy the whole journey. It sounds obvious now, but looking back and remembering my thoughts when trekking in the UK, I realise that I was more concerned with the summit and not the whole experience. 360 Expeditions have built solid relationships with many guides and porters and that was evident to see in their interactions with each other. There was respect on all sides and so much experience to help give our group the best possible summit attempt. I wasn’t prepared for the numerous emotions that would be with me on the mountain. There was time to think and reflect especially at the lower stages of the climb. There were many smiling faces as porters went whizzing by the group carrying our tents and food and then of course there was the singing and clapping which is famous the world over. I felt lucky and privileged to be on this journey with a great group of fellow climbers (we all got on) and with the 360 team. I must admit as we got closer to the mountain, it began to become even more forbidding and I wondered how on earth we would make the summit. But I had confidence that Rolfe and the crew would give us the best chance. I didn’t question and I didn’t think too much about what was to come I just kept enjoying the experience. By the way, the food was amazing as was the work that everyone on the crew did for us. It didn’t seem right that the crew would do the same journey and then do a huge amount of work to keep us safe, secure and fed but that was how it was. Smiles everywhere from our crew, truly that was special in itself. On one afternoon we arrived in camp with time to spare and nothing to do as it was pouring with rain. And before we knew it, the crew had made some tea and popcorn and Rolfe was showing us a new card game. Always for me it’s the little touches that make the experience. Along the way Rolfe would give us daily briefings on what to expect next and how to prepare and he would check in and see how the group was coping with the altitude. And as we approached summit night our group was in a good shape and by now we knew the words to all the songs and chants that had become ingrained since our arrival. There is nothing that can prepare you for how you will feel on the summit night attempt. Before leaving the UK I had planned what I would be wearing on summit night, I even had it all stowed away in a neat bag and I was ready to go. But when it came to waking up at 23.00 hours to get ready and leave at midnight for the attempt I found myself thinking again about what to take and generally messing around with kit. It must have been my nerves kicking in. Nothing needed to change from my original plan but there I was changing it. I took a few deep breaths and calmed down. Now all I needed to do was focus. 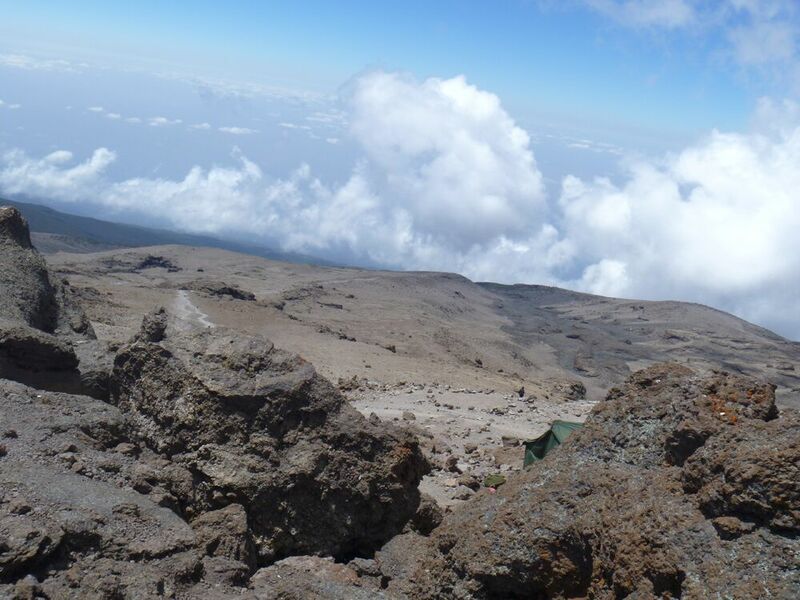 Throughout the journey leading to this point 360 had shown how much they wanted each of us to succeed and reach the summit safely and now we were on our final approach with just about 1200 metres to go for success. It would be the longest 1200 metres of my life. Rolfe had allocated a guide per person to take our rucksacks if needed and our guide would be with us for the climb up and down. There was something very reassuring about knowing that we each had a dedicated guide. We were in the dark using the lights from our head torches to pick our way and we had no idea how challenging this summit was going to be. With winds buffeting us at 45 mph and a wind chill of negative 18 it was set to be quite a night. Rolfe kept checking in with all the climbers. He would march up and look you in the eyes to find out how you were coping. I remember shouting at him at one point determined not to be sent back down the hill. I was ill on the way up and at one stage didn’t have any idea how I was going to make the top but with a great sense of spirit with our group and the encouragement of 360 somehow I just kept going. A lot easier said than done (you can only understand this if you have made the climb). Reaching Stellar Point, I knew I would make it to the summit. It sounded simple enough after all there was only 185 metres to go and how far is that on a normal day. But this was not a normal day and the exhaustion was kicking in big time. It was estimated that it would take an hour to do the last 185 metres which seems incomprehensible as I write this review but it turned out to be true. The sunrise came, my spirits lifted as I was no longer in the dark and could see a beautiful landscape and with that energy started to bring new life to my body which was still desperately tired and longed to rest. People at home before I set out on the adventure had said just put one foot in front of the other and at the time I remember thinking, well that sounds simple enough. But the reality was very different, it was the hardest thing to do, to keep fighting, to get to the summit. 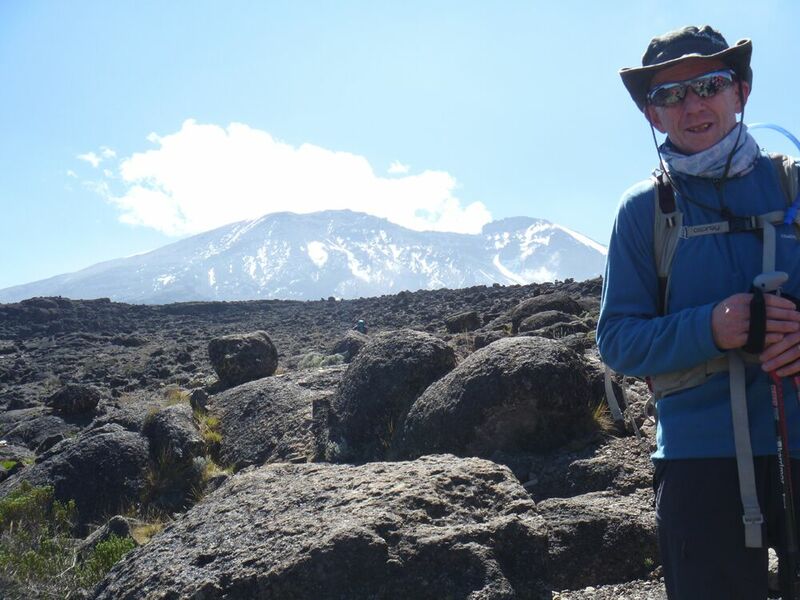 Rolfe and the 360 crew never gave up on any of us and they kept being hugely positive and I recall walking along with Rolfe towards the end and he became super excited as he saw a side of Kilimanjaro that he had never seen before even though he has done this trek 57 times already. His animation and enthusiasm spurred me on and finally I made the summit. Arriving at the top I was overwhelmingly happy and triumphant. I had made the summit and then it happened, I sat down and wept. 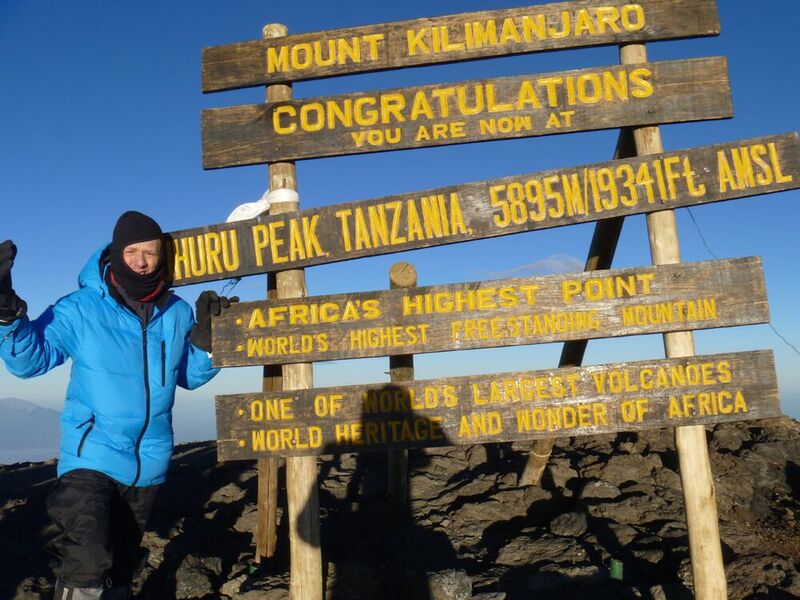 For me it was very emotional being at the top of Africa and feeling blessed to be there and knowing that I would be able to share my memories with my wife, family and friends. I was thankful to everyone who had played a part in getting me there safely. Safely at the summit, safely back down the mountain and safely home. The crew at 360 kept on looking after us every step of the way. One of the final touches that stays with me was at the Celebratory Dinner back at the hotel when Rolfe presented the certificates to the climbers that had succeeded (which happened to be all 14 of us). Before he handed the certificate, Rolfe said a few words about the recipient. It was a lovely thing to do and it was clear that over the adventure Rolfe had come to understand a lot about the climbers in his care. For me there was something very special about the warmth of 360 Expeditions. I am looking forward to the next trip already.